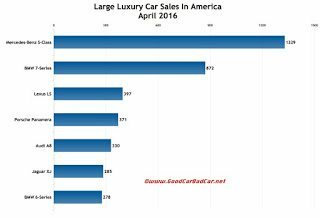 Plunging luxury car sales were the order of the day in the United States in April 2016. At the low end, the Mercedes-Benz CLA-Class slipped 17%. Among the most popular premium cars, Mercedes-Benz C-Class sales fell 15%. 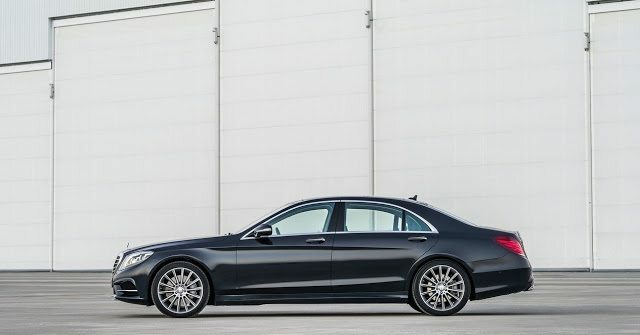 And at the high end, Mercedes-Benz S-Class volume plunged 34%, a loss of 692 sales compared with April 2015. Lost car volume at virtually every level is being made up – mostly – by healthy utility vehicle volume. In April, the Mercedes-Benz GL-Class (and its GLS successor) jumped 36%, a gain of 796 sales. Outside of the traditional luxury mainstream, HybridCars.com estimates that Tesla Model S sales slid 11% to 1700 units, well in excess of other cars in this category but the Model S’s second-lowest total since September. 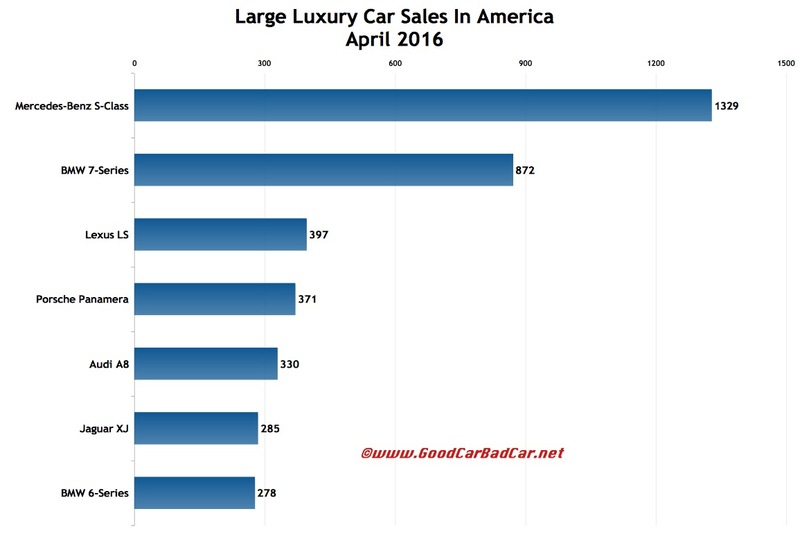 This table is sortable, so you can rank large luxury cars any which way you like. Suggestions on how GCBC should break down segments can be passed on through the Contact page. GCBC isn’t here to break down segments, an impossible task for any group, but to display sales data for the sake of comparison. The BMW 6-Series is listed here as it now features a “mainstream” sedan bodystyle in addition to its two-door variants, just like the larger S-Class. You can always find the sales results for EVERY vehicle and form your own competitive sets by using the All Vehicle Rankings posts. Sales data for brands such as Aston Martin, Ferrari, Lamborghini, Lotus, Rolls-Royce etc. are unfortunately not broken down by model. estimates say sales for Aston Martin and Lotus were 344 and 56, respectively, in the first four months of 2016. Ferrari sold 733 cars in the first one-third of 2016, Lamborghini another 342, Rolls-Royce another 301. Tesla, unfortunately, doesn’t release model-specific monthly U.S. sales data, but HybridCars.com estimates 1700 Tesla Model S sales in April (down 10.5%) and 7900 YTD (up 34.7%).